When Bite Copenhagen opens its doors to Forum on the 24th and 25th of August, a number of the most innovative producers are ready to present their products. Products which are characterized by high quality, innovation and respect for the environment. One of these is the fishmonger Jacob Kongsbak Lassens 'Kongs Bike' - probably the world's first purpose-built electric bike for deliveries of fish. 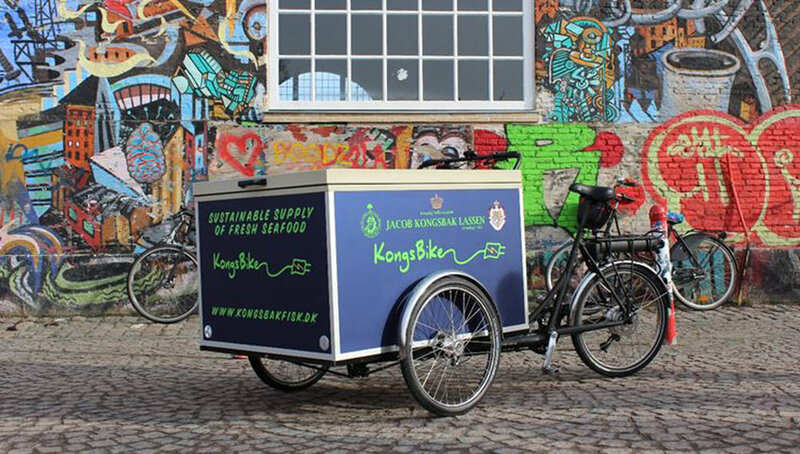 The electric bike has just become the company’s new delivery method when the fresh fish needs to be distributed to Copenhagen's best restaurant in the center of town. At Bite Copenhagen Jacob Kongsbak Lassen will introduce the new invention, from which they expect great things in the future. "We live by nature, so we must also take good care of it. With ‘Kongsbiken’ we want to show that it is possible to deliver the 'old fashioned' way without sacrificing freshness or time while we also alleviate som of the heavy traffic from the city center. The different approach to food that Bite Copenhagen represents, we can agree to fully," says sales consultant Frank Kofoed from Jacob Kongsbak Lassen. Bite Copenhagen embraces the culinary innovators and producers with history and craftsmanship in the luggage. At the exhibiton you can also meet the Danish cider producer Æblerov which manufactures high-quality apple cider by Danish organic apples. Æblerov is a Danish term for gathering fresh apples in gardens or nature. A practice that especially kids have fun with, sometimes without asking. The company is called Æblerov, because the two friends behind the project initially found their harvest in Copenhagen gardens, where the apples still was not used. Not long after the project was birthed, an award winning cider saw the light of day. A cider which is so good that even world famous restaurant Noma put it on their wine menu. Today Æblerov is organically certified and get the apples from the best plantations in Sealand, Lolland and Moen, who use the overlooked Danish apple varieties. "Today, our customers are primarily small restaurants, but we would also like a wider audience and introduce our products to some other types of customers than those we usually serve," says Morten Sylvest Noer from Æblerov. Getting something great out of a commodity, laying around and waiting to be used, is something that is recognized by Nordisk Tang, who has been in a leading position when it comes to products made of Nordic seaweed varieties. Ten years ago, only few people spoke of seaweed in Denmark, but gradually the product's immense taste and potential to elevate cooking to new heights, has been acknowledged by many more people, than just the top restaurants and the Asian kitchen. "We are present at Bite Copenhagen because the exhibitions’ focus on the new and innovative, will be a great showcase for our products. We believe that the era of seaweed is now, and so it is natural to introduce seaweed products for a customer segment that has the curiosity to ride the new trends in the world of gastronomy, "says marketing manager Heine Max Olesen from Nordic Tang. Conversely, everyone knows Italian parma ham, sun-dried tomatoes and olives, which is something the Italian food imports Ello Foods has in abundance. Therefore, they will use Bite Copenhagen not to present that, but rather present an innovative product that few people associate with Italy, says event manager Jesper Schmidt. "Everyone knows parma ham and olives, so at Bite Copenhagen we will focus on two fantastic Italian gin, which is radically different from what you are used to. One of these, are for example made of hops and shells from the production of cherries, and gives the gin a unique taste. It is a company that represents the new generation of Italian producers who make innovative products with edge and personality ". There is still a possibility to be part of Bite Copenhagen's selection of quality oriented exhibitors. Click on 'Exhibit at Bite' at the top of the page to make an non-binding application.